I have a friend, who is serving at Gitmo as a chaplain. For the past nine months (or so) since he started his deployment, I've tried to figure out what to send as a care package. I wanted it to be good - not a cheesy, package. 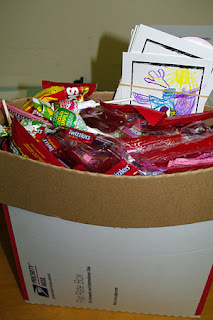 So this week, thanks to some help from the kids at Timothy Team & the M&M Day at church (Marvelous & Magnificent Day (camp)) I finally pulled together a package to send to my friend. 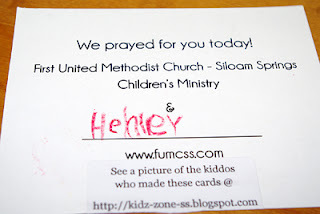 During the last two weeks, I've had the kids at church color "happy notes" for my friend to hand out. 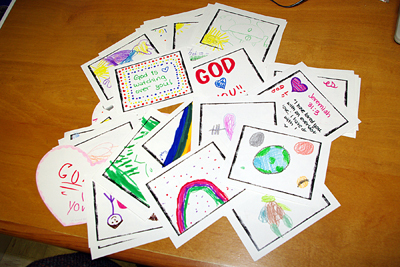 The cards, as created by First UMC kids! Simple and direct. 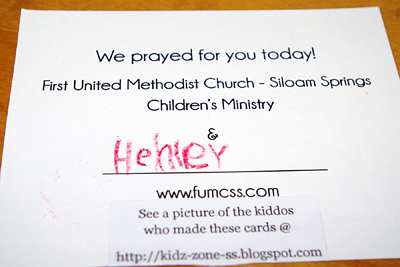 On the back of the cards, we posted information about the children's ministry and gave the kids a place to write their name on the back. The back of the card - didn't Henley write his name well! So Tuesday morning, I went shopping for candy - anything that sounded good and wouldn't melt as it traveled via the military to Cuba - along with a special request from my friend's sweet tooth! It took a lot of "packing" (I actually had to get another box) to get all of the candy in a "flat shipping rate" box from the Post Office. So the box is on it's way to Cuba. Hopefully it will arrive before Halloween. Here's the deal though. I almost didn't send anything, because I was worried that this wasn't enough. 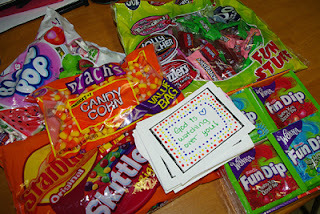 I mean, really, when you get right down to it - it's a box of note cards and candy. Not much "substance" but instead, a gift mailed with a lot of good wishes and prayers sent by the students. I've wanted to do something for a long time, but I almost let my fear and indecision keep me from doing something. If I waited, I would have missed out on being able to bless a friend, who in turn, can pass along the blessings to people he serves with on the army base. I would have also denied the kids @ church a chance to make cards for a group of soldiers. Sometimes the church in general is like this. 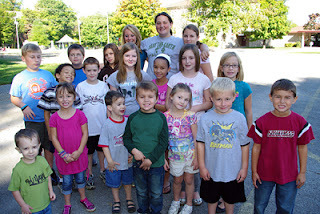 We (collective we) talk about doing things, and even make plans - but somehow our follow-through ends up lacking. We let our indecision keep us in a rut - and miss out on the possible joy and excitement found in the unknown. So, for once, I've set aside the worry and the indecision, and maybe even fear of being "not quite perfect" in order to do something that will hopefully bless others. What will you do today to bless someone? What is keeping you from being a blessing?